I can’t believe Friday will be May 1st. This weekend is coming up super fast! Normally I can’t wait to get to the weekend, but this upcoming weekend has me a little apprehensive. Now that the time is approaching so quickly I am very positively freaked. I have not trained adequately. At all. Or, to be more accurate- I have not trained at all. Zip. Zero (stingy with dinero). I know I won’t die- but my “sitting bones” may make me wish that I did. I did, however, acquire some pretty sweet swag! A training shirt that has THREE pockets AND a huge zipper- it’s in the back, so that will be challenging for people like me, but makes it great for times that I need a place to stick GU, gum or Chapstick (besides my bra). 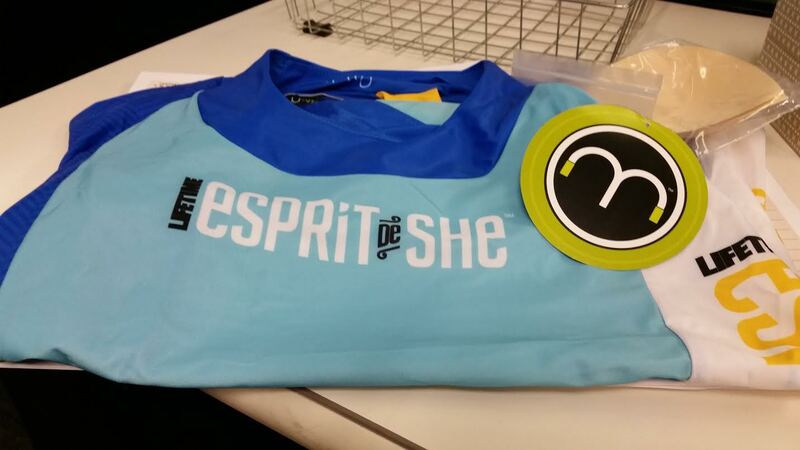 The race shirt also has nip hiders that slip inside the fabric of the shirt. How cool is that! Pretty neat the things that are looked at a bit differently since this is a race planned by females and ran (biked) by females. Trying real hard to get more psyched than freaked, for Sunday. My first duathlon! SCARY, heady stuff! This will definitely be a big challenge for me. I have never ran without music. OK, well in 20+ years I haven’t ran without music. I just remember how bad it SUCKED running Cross Country in high school and not having tunes to muffle my labored breathing and horridly dark thoughts. YUCK. I may have felt differently if I were faster and it were over and done with quicker, but as a seriously slow distance runner I have a lot of time to my own thoughts…and I have a very sick, twisted and dark mind. No one wants to spend that much time swimming around in there!